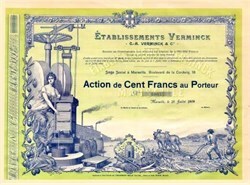 Beautifully engraved unissued Certificate from the famous Establishment Verminck, Marseille printed in 1909. This historic document has an ornate border around it with images of olives, a man plowing the land and a woman next to machinery processing oil. This item is and is over 91 years old. The Company made soap of Marseille for the Hercules Soap Company. Earlier in the 20th century and prior, the product was derived from olive oil. As the century progressed, artificial sodium carbonate replaced the plant sodium carbonate.